Bloomsbury USA Childrens, 9781599900681, 80pp. Want to blast into orbit? Walk on the moon? Snag a personal photo of a shooting star? Well your time is coming! And when it does, you're going to need How Do You Burp in Space? This guide is filled with the kind of information you'd need to plan any vacation including what to pack (hint: no bubble bath or juggling balls! ); what to expect from your accomodations (a sleeping bag attached to the wall), and what to do for fun (leapfrog on the moon!). Grounded in the history of space travel and the planned future of space tourism, this guide book will leave young adventurers daydreaming about future intergalactic space vacations. Get ready to rock your rocketship! 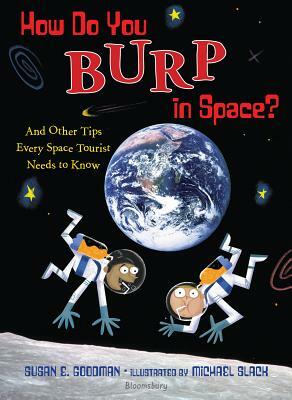 Susan E. Goodman is the author of more than thirty nonfiction books for children, including How Do You Burp in Space? ; See How They Run: Campaign Dreams, Election Schemes, and the Race to the White House;All in Just One Cookie, an ALA Notable Book; and On This Spot, a Washington Post Top Picture Book of the Year. She lives in Boston, Massachusetts. Michael Slack is the creator of Monkey Truck and Elecopter. He is an artist and character designer whose work has been featured in books, television, and games. He lives in Lafayette, California with his wife and daughter.